For the customer to be sure that his request is being procesed on the website and he will get the selected item it is convenient to send him a message (Email/SMS) with a notification about completing this or that order processing stage. This feature is also useful for announcing about special and latest offers on the website. It is possible to send a letter as from the customer card, as well as from the order card. e-mail address, where the message was sent. Template. If you already have premade templates (section Administration > Communications > Letter templates), it is possible to select appropriate one, pressing the triangle in the right part of the line and the most part of the letter lines will be filled. If the function is not configured, this field can be left blank. Important: If templates are not created, this line is not displayed! From. The shop address is filled in automatically. To. In this line the address is written, to which the letter will be sent, it can be changed and edited. The fields “From” and “To” can contain as the address itself, for example, info@site.com, as well as the extended record oth kind Steven Stevens <info@site.ru>. Letter subject. You can fill in this line manually or, if the needed variant is seleceted in the line Template, Theme line will be autocompleted. Text. 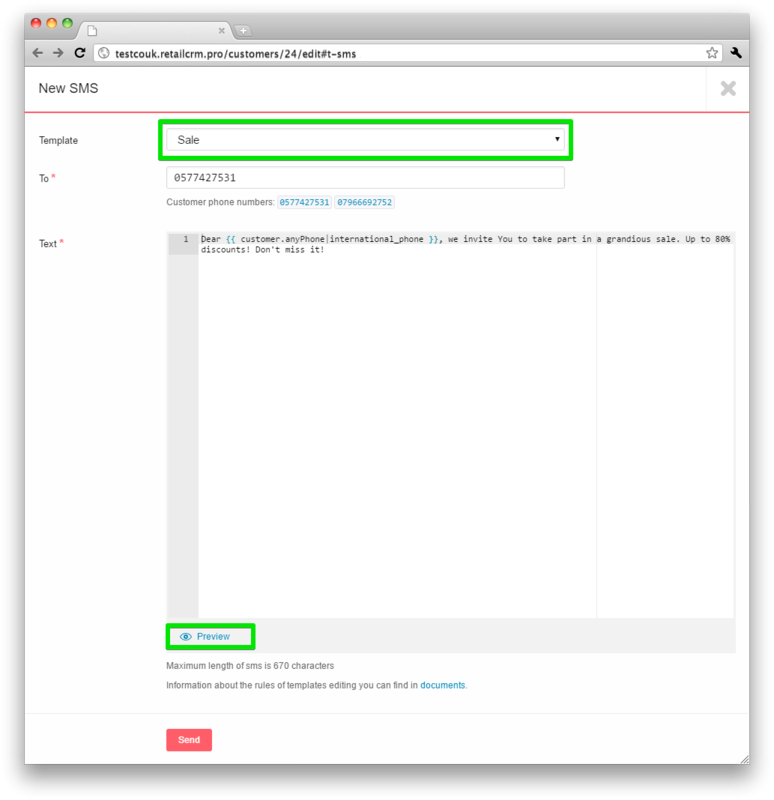 You can enter the text yourself or it will apper automatically, if the needed variant is selected in the Template line. Instruments for letter formatting. 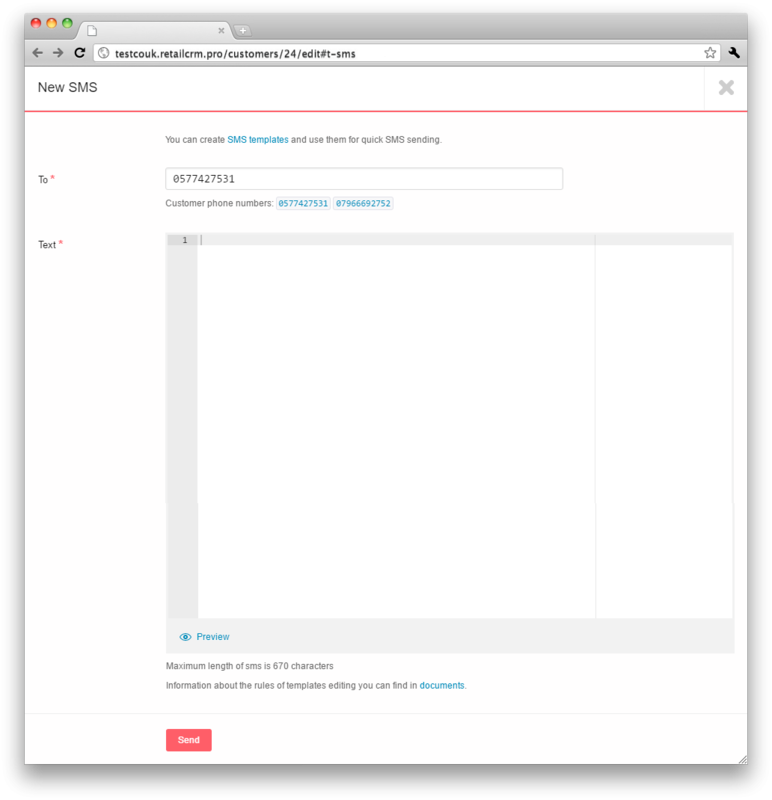 Insert tables, lists, links, pictures. Preview. Pressing the link with the name “Preview” your letter will open in the view, in which it comes to the customer. Attached files. 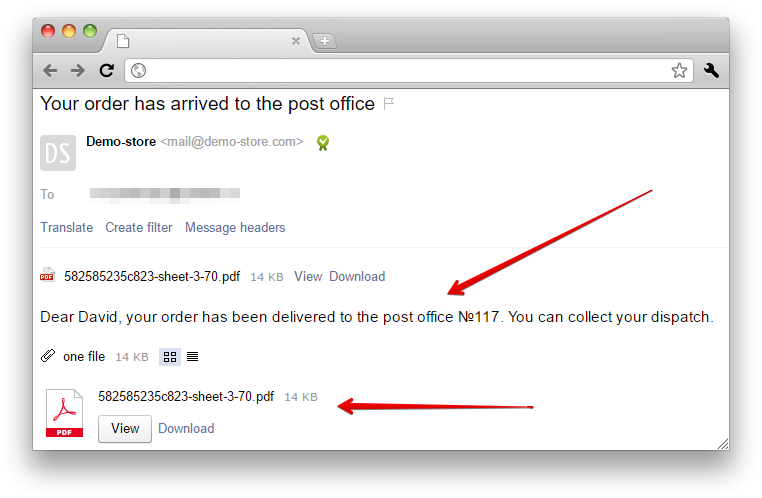 A feature has been added to attach file to the letter (it can be a price list). Important: It is possible to attach not more than 10 files, the total size of which should not be more than 10 megabytes. 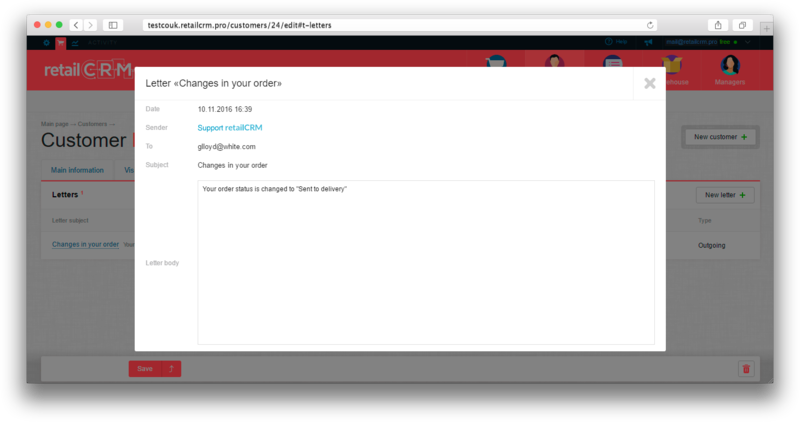 On the order page, right to the delivery address and below the customer and operator comments, there is a window “Communications” with Letters and SMS tabs. Selecting “Letters”, the letters will open, which have been already sent in this order. The theme of the letter is displayed here (it is clickable - pressing it, the letter will open) and the date of sending. Pressing the button New letter the same completion form will open for data input, as on the order page. 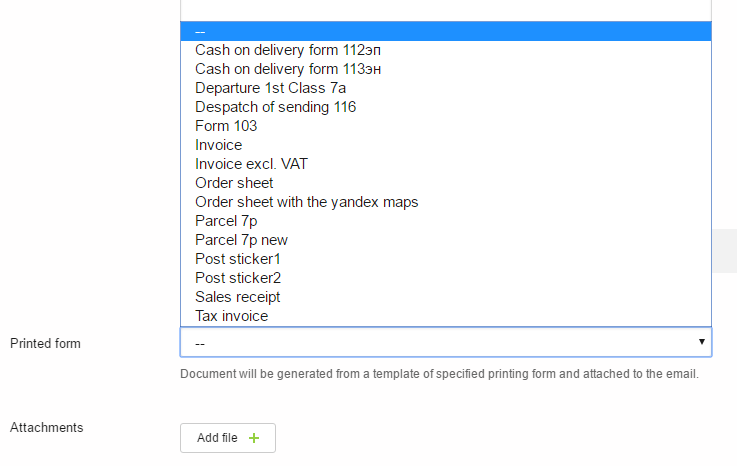 The difference will be that it will be possible to attach a Printed form to the letter. Pressing the triangle in the right part of the line, all the printed forms present in the system will open and it will be possible to attach them to the letter. It worth paying attention, that the printed form can be added to the letter, which will be sent only from the Order page. More about the attachment of a printed form to the letter template is written here: The feature of attachment of a printed form to the letter template. The important moment is the displayment of order number in the letter created on the order page. An SMS, as well as a letter to customer, can be sent as from customer card, as well as from the order card. There is also opportunity of SMS sending to customer base, using customer segmentation. Template. If you already have premade templates (section Administration > Communications > SMS Templates), you can select the appropriate one pressing the triangle in the right part of the line and the most part of the SMS lines will be filled in. 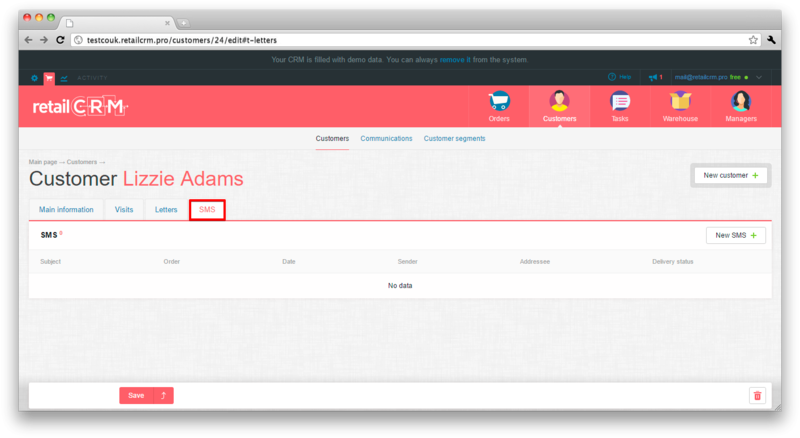 If the feature is not configured, the field can be left blank. Important moment! If the templates are not created, this line is not displayed! To. This line is filled by customer phone number. Text. You can insert the text yourself or it will appear automatically, if the needed option is selected in the line Template. Useful function - Preview. You can look how the SMS looks before sending. 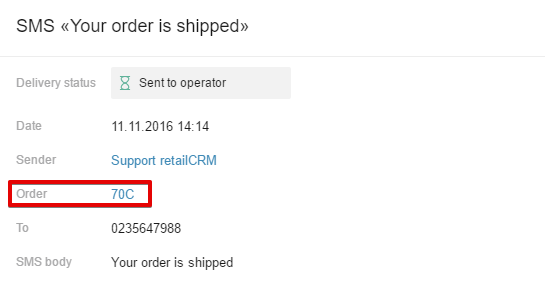 On the order page, right from the delivery address under the customer and operator comments, there is a window “Communications” with tabs Letters and SMS. Selecting “SMS”, already sent messages in this order will open. The theme of the message is displayed here (it is clickable - pressing it, the message will open), and also the date of sending and the manager who sent the message. Near the “SMS” word there is a numeric symbol showing the number of SMS in this order. 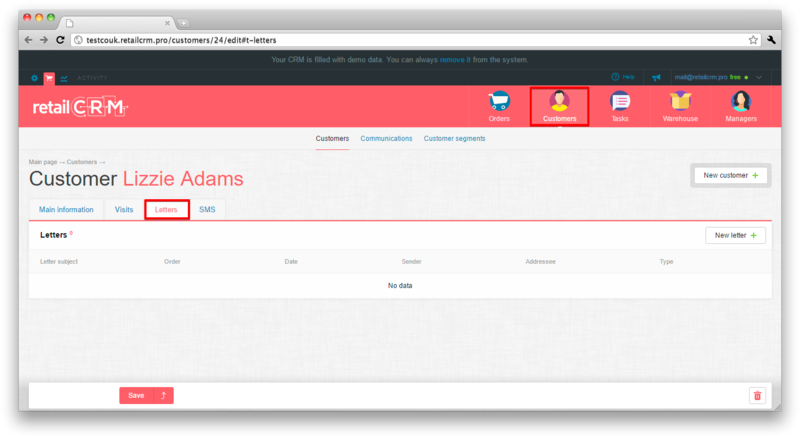 Pressing button New SMS the same form will open, as on the customer page. 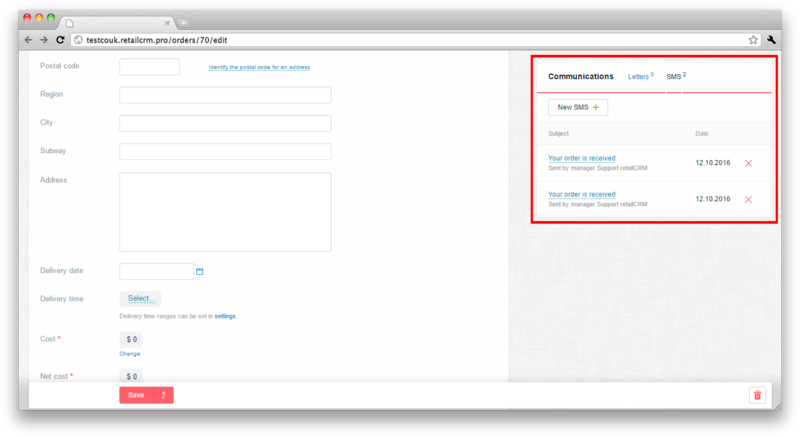 The important thing is that the order number is displayed in the SMS created on the order page. «Unidentified» - in this status are all SMS sent before 1 september 2015. SMS status check is performed in the interval from several minutes to several hours, depending on how long ago the notification has been sent. As soon as the system gets information about final SMS delivery statuses - “Delivered” or “Not delivered”, data request on these notifications is over. The last request on the system side is performed after 24 hours from the SMS sending. operator equipment experiences technical problems. Payment is taken for sent letters and SMS. You can see prices for you tariff in you personal account. 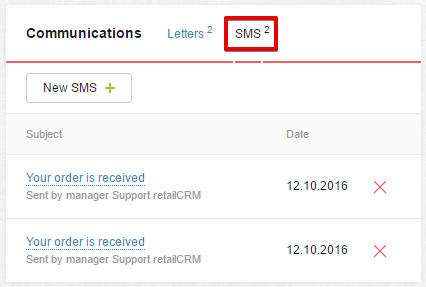 More about the ways of creating and configuration of letter and SMS templates is written hereLetter and SMS templates. 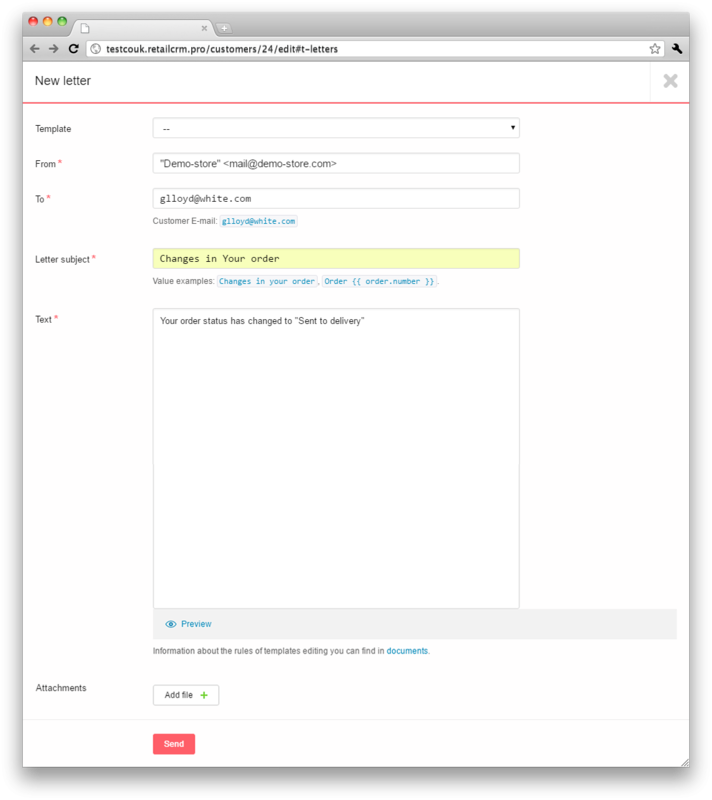 You can read about automatic SMS and email sending on the event here Triggers.